Later on today the AFL will unveil the initial All Australian squad of 40, ahead of the team’s announcement on Wednesday. We can skip all that: here’s the team of the year for 2018. If there is one thing the pre-finals bye affords us it is some time to breathe. 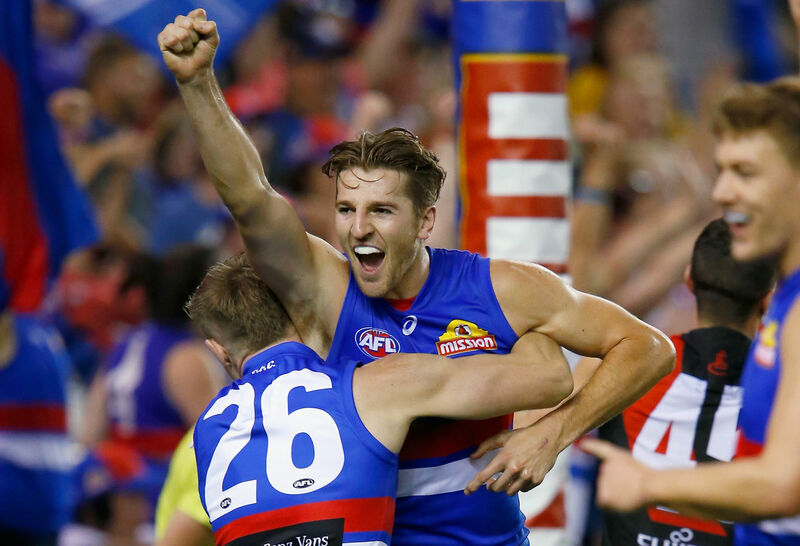 We don’t need to jump into finals mode instantly – we can spend a little bit of time relishing a compelling 2018 home and away season, which ultimately came down to the second last game of the year. But what it could’ve been, as Brad Scott said in his post-game press conference after the ‘Roos 12th win of the year. It was a season that turned on a knife’s edge about 973 times. Four teams finished on 12 wins and didn’t make the finals, which was surely the first time that has happened in the history of the league. What if North Melbourne hadn’t been bested by Gold Coast in a torrential downpour in Round 1? What if Adelaide had put a few less kilograms on the machines on leg day this off season? What if Essendon had’ve shown up against Carlton and Fremantle in the first half of the season? What if Port Adelaide had closed out just one of the half a dozen games it let slip in the last ten minutes? That’s for later in the week. For now, we have business to attend to: the All Australian team for 2018. First of all, this is supposed to be a 1,000-word column so my remarks on my team will be relatively (for me) brief. Second of all, I am a firm believer in the notion the All Australian team should be something of a time capsule for the season it represents. There is some conflict in this: we want a team that captures the essence of the year from a structure perspective, but equally we have to reward the best 22 seasons if we can. That will lead to some harsh calls – particularly for tall forwards. Finally, past performance does not matter, nor does potential. We value what happened in the 2018 home and away season. One selection I ummed and ahhed over for far too long (given I have no say in the selection of the actual team) was between Josh Caddy and Jack Gunston. I was so torn I put up a Twitter poll, and a lot of folks pointed to Gunston’s ability to go back compared to Caddy’s more defined role. That’s fine, but isn’t relevant to the discussion. This also means players don’t get judged because they’ve had a ‘down year’ if a ‘down year’ means going from Brownlow medallist to ‘leading the league in score involvements and centre bounce clearances’. 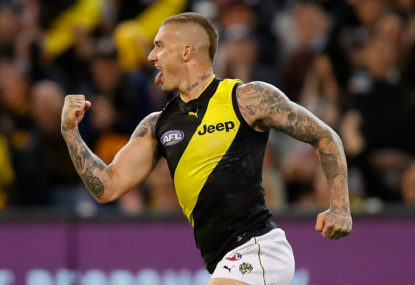 Dustin Martin is in. And here is who else makes it into my team. Let’s go line by line in a paragraph each. Rory Laird is the golden god of small defenders, blanketing his man when he has one, helping over the top, and winning an extraordinary amount of the ball on the deck. Alex Rance is a default selection, and contrary to popular opinion leads the league in defensive one on ones this year (and has twice as many as Dylan Grimes, who’ll no doubt make today’s squad). Tom Stewart is my choice for the flex spot, the Geelong defender as competent beating his man as he is in spoiling over the top and powering the ball back on counterattack. Shannon Hurn has had a career year on the half back line, his disposal quality returning to his mid-20s peak as the Eagles’ game plan demanded it. Phil Davis beats out Jeremy McGovern to the centre half back spot, the Giant an anchor down back in what was a tough year for GWS from a player availability point of view. What Davis gives up on McGovern in intercept marking he more than makes up in defensive one on one prowess, spoils and work once the ball hits the deck. His team mate Lachie Whitfield is the other half back – sneakily good as a defender, while absolutely lethal with the ball in hand (as Cam Rose often says, gun midfielders make the best half backs because it’s a much easier position to play!). The centre line picks itself: Andrew Gaff has had a career season, adding some inside flex to his previously outside-oriented game. 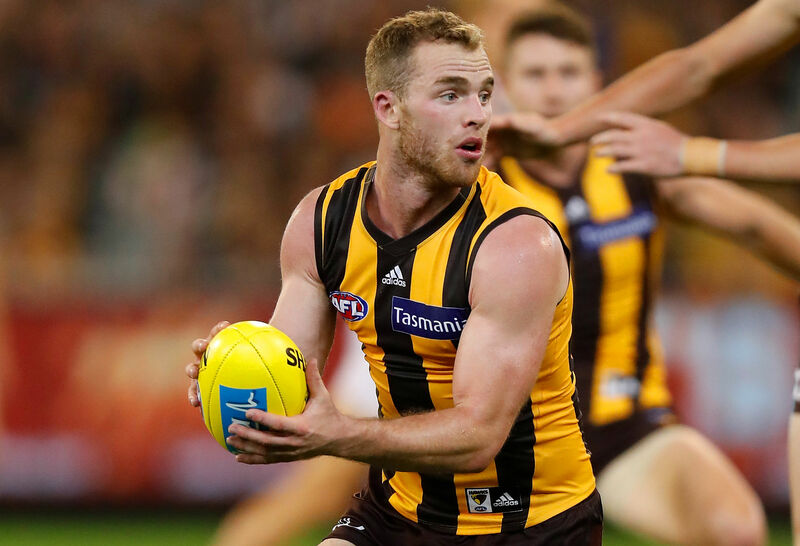 Tom Mitchell is Tom Mitchell. Jack Macrae was like Gaff-lite over the full year, but for a month around the mid way point looked like the best player in the competition. Patrick Dangerfield is the only time share midfielder picked in my forward line, a reflection of his changed role in 2018 plus his still-stellar midfield output. Lance Franklin played 18 games but crammed 25 games worth of output into them – and almost won the freaking Coleman medal again. The aforementioned Caddy makes it on the left half forward flank – a dead eye with the ball, he’s the ideal flex forward in a year where the position became its own sub-type. Luke Breust was far and away the best small forward of the season, leading the league in forward 50 ground ball gets and finishing top five in the Coleman medal. Coleman medallist Jack Riewoldt stands at full forward as is tradition, but he’s earned his place with his play outside of kicking six pointers. The final forward spot is tricky because there is no way known we can pick three talls. Except we have to – there has been so many quality seasons by tall guys, and comparatively few from strictly small forwards. Tom Hawkins gets the nod over Ben Brown, booting three less goals in two fewer games, but assisting on plenty more and being involved in even more again. I briefly considered Melbourne’s Jake Melksham for the spot, but sanity (I think) prevails in the end. The follower line is largely uncontroversial. Max Gawn gets the starting ruck spot for his ruck work, plus his ability to work the wings and defensive end of the ground. Clayton Oliver was probably the most influential player this season outside of Franklin; at 20 years of age this guy’s ceiling isn’t in our view. 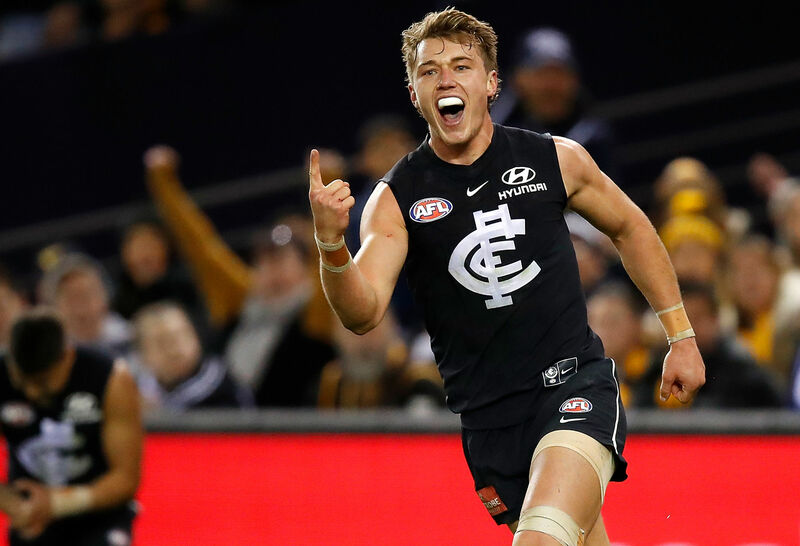 Patrick Cripps broke the record for most contested possessions in a home and away season, and carried his entire club on his heavily taped shoulders. I just hope the Blues are good again before he breaks. As for the bench, Brody Grundy has to get the number one bench spot in recognition of his remarkable season. He can’t be penalised because his season happened to happen simultaneously with Gawn’s. 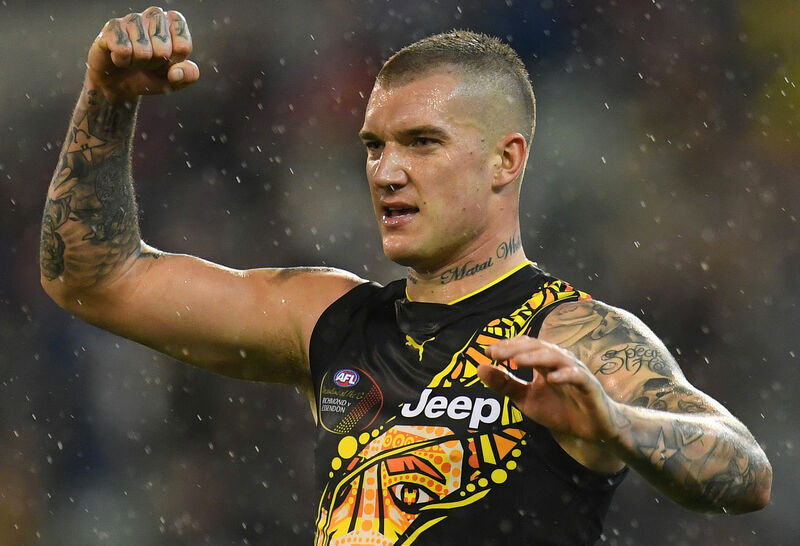 Dustin Martin led the league in score involvements and centre bounce clearances; he might’ve less grunt work on the outside for the Tigers, but he didn’t need to do it this year, and the killer was still there for all to see. Marcus Bontempelli put together an under-the-radar stellar season, his hands and kicking boots as clean as ever. He doesn’t need 35 touches to influence games. Speaking of which, Nat Fyfe probably won’t get picked in the All Australian 22 on account of playing 15 of 22 games, but his performance in two thirds of the season was enough for him to be considered one of the best players of the season as a whole for mine. There are probably quibbles everywhere. Ben Brown was in the All Australian team for two thirds of the season, but a quieter end to the year once the ‘Roos started to slow down as well as his more one dimensional game cost him. If Elliot Yeo won another bench spot over Bontempelli or Fyfe I wouldn’t be too perturbed. Nick Vlaustin is one of my favourite players and could easily be in instead of Whitfield. The Giants haven’t got a midfielder in my side, but either of Callan Ward or Stephen Coniglio could make it in and that would be fine. Jeremy McGovern will probably make it into the side over Davis because of the fetishisation of intercept marks. Robbie Gray could be an option for a small forward spot. Steele Sidebottom will make the squad and could be worthy of a bench spot; Shaun Higgins, Paul Seedsman and Devon Smith are in that class as well. Injury will rob Harris Andrews, Josh Kelly, James Sicily and Adam Treloar of a place. There will undoubtedly be an obscure stats-based squad selection (Mark Blicavs lost just 14 per cent of his defensive one on ones – that would be my pick). But it doesn’t matter, because you already know the All Australian team for 2018. It’s a scroll or two above.